Award-winning Norfolk and Suffolk textile artist Abigail Mill is making her final preparations for the RHS Chelsea Flower Show. This is the third year running that Abigail, who has been featured in various Uniquely publications, has been selected for the celebrated event beginning on Tuesday 22 May. 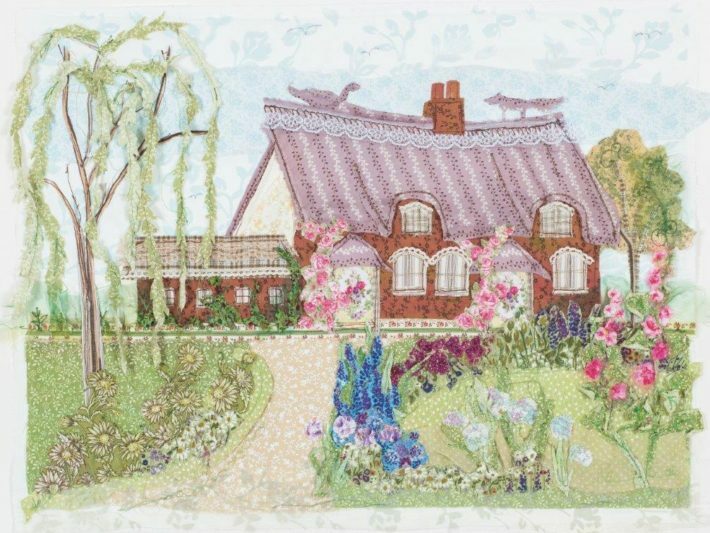 The embroidery expert, who has a world-wide following and was awarded three gold stars by the Royal Horticultural Society for her stand last year, will be revealing new original artwork, as well as her 2017 collection of limited edition giclée prints, giftware and cards. One of the new pieces of textile art will also feature an exquisite thatched cottage near Bungay. “I am very influenced by my surroundings in all my work,” says Abigail, who has recently returned to Norfolk after spending a few years in Bristol. A frequent exhibitor at Hampton Court, Tatton Park and RHS Wisley, Abigail also displays her work at the Royal Norfolk Show, the Suffolk Show and the Burnham Market Craft Fair. Her coffee table book Appliqué Art was recently published by Search Press and she was commissioned to produce a piece of original artwork for the Buxton Ward at the NNUH. “I have been a textile artist for 25 years now and have never been busier,” she says. “I have just been commissioned to produce a piece for Southwold Pier and have won a Norwich 4 New Enterprise grant to develop my website and offer on-line tutorials. Abigail adds: “Of everything I do, however, I think the RHS Chelsea Flower Show is the most exciting, exhilarating and exhausting! “I meet so many people, from members of the royal family and celebrities to those who follow my work. I always enjoy seeing visitors who have come from Norfolk and Suffolk, as well as those who have travelled from as far afield as America. RHS Chelsea Flower Show runs from Tuesday 22 to Saturday 27 May.